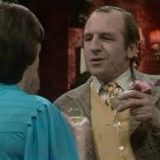 Pink carnations – By an astonishing coincidence, Rigsby and Ruth answer the personal ad each has placed in the local paper and meet at the same hotel, both wearing pink carnations for identification purposes. Unfortunately, a spanner is thrown into the works when a bridal party arrives and both the bride and groom are also sporting pink carnations. Needless to say, total hilarity ensues. Fire and Brimstone – Gwyn, an abstinent fundamentalist Welsh preacher moves in and talks Ruth out of going on a dirty weekend with Rigsby because it would be immoral. He also has some success in converting Rigsby to the faith. However, Ruth gets excited when he explains to her a passionate extract from the bible and she throws herself at him.